Friday afternoon and evening we spent a few hours with Bro. Shobanke's family in his home. Our trip in 2016 was the first time we gathered like this with his family and I am super glad we had time to schedule it again this year. We love Bro. Shobanke and his family and it is great to be able to spend time with them and get to know them a little better outside of church. Sis. Rebecca and Sis. Ruth presented a wonderful meal to the whole family. We enjoyed the meal and all of the fellowship too. This is my friend Damaris. Damaris, also named Gloria, is the daughter of Bro. Samuel and Sis. Ruth. She made sure that I was never without company every time she was around us the whole trip. Thank you, very much young lady. You were so kind to me. Praise, also known as Daniel, was another constant companion of mine. He has a beautiful smile and very sweet and helpful disposition. Kelly Jo took lots of pictures of him Friday, but most of them were blurry. He is a bundle of energy and seldom stops moving. He is the oldest son of Bro. John and Sis. Rebecca. Thank you for your friendship, Praise! I had to work to earn Gideon's trust. He is the second child of Bro. Samuel and Sis. Ruth. In the picture below, he is starting to warm up a little. By the time the evening was over, he was sitting on my lap for the group picture. From right to left at the table below: Bro. Shobanke, son in law Samuel, son in law, John, son Emmanuel, son Samuel. Rebecca in the foreground and Ruth in the background. We brought small gifts for each of the family and Odie sent small gifts as well. I was showing pictures of the construction process of the house for Odie. Construction practices are so different in various parts of the world and it was interesting to the men. Samuel Shobanke studied architecture so the pictures were especially interesting to him. The picture below has almost everyone included. Only son in law John and little David were missing. Front row left to right: Bro. Shobanke, Praise, Davy Gideon and Damaris. A Pastor from the area stopped early in the afternoon to greet us before we go back to the USA. His name is Pastor Sampson. May God bless him for his kindness. We visited until it was probably too late and then they drove us back to the hotel. It was a wonderful day. Saturday we visited for a while with Bro. Shobanke at the hotel before and after lunch. Lunch was at a local favorite of ours, Chicken Republic. The rest of the day was spent getting all the things ready for our trip to Ibadan Sunday and for our trip toward the US on Monday. Kelly Jo works so hard on a trip like this and I appreciate it very much. 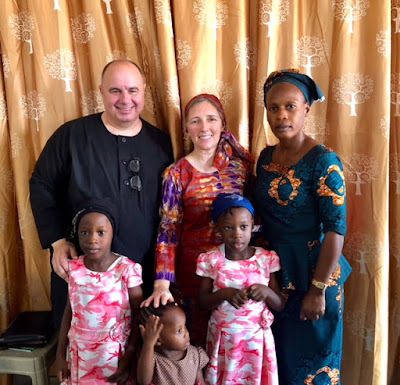 We were up and out the door by 7:30 Sunday morning and arrived at Landmark Christ Mission in Ibadan, Oyo State in about two hours. They were just cranking up the Sunday morning service when Pastor Stephen Kuye welcomed us in his office. It was so nice to be back at Landmark. The service was very good and the church responded really well to the preaching. I am expecting to hear reports of miracles as we all reached toward God in faith. I know that God hears and answers prayers and I can not wait to hear what He has done in the lives of people in the service Sunday morning. At the end of service, we passed out candy to the kids and then greeted everyone with hugs, handshakes and pictures all around. It was a very special time. When we finally left, I did not think the kids were going to let us go. They loved on us until we felt entirely loved by these great people. Pastor Kuye took us to KFC for a final treat. We enjoyed a spicy good meal and great fellowship with my brothers. I try to tell these men how much I love them, but I am not sure I can ever make it clear enough. These men truly are my dear brothers. Bro. Kuye presented us with this framed picture welcoming us back to Landmark Christ Mission. It has various pictures of our previous visits. It is beautiful. I hope we can get it back home in one piece. After these next two pictures, we posed for many, many pictures. Hopefully, they will send me some of them to post later. We arrived back at the hotel Sunday evening and were blessed to spend some more time with Bro. Shobanke. After he left, we spent the rest of the evening finalizing our preparations for the ride to Lagos and the flight to the USA. If all goes as planned, we will be flying by the time Tuesday's post is supposed to go up and I hope to have something prepared for that post. Thank you for reading while we have been in Nigeria. I am sure we will have many more things to say about these amazing people and the wonderful experiences we have had this year.